The phone number for the Smoker’s Helpline was added to the cigarette package warning labels and inserts introduced in 2012.xiii In 2015, most current smokers (83.9%a) said that they were aware of “1-800 telephone quit-lines or other smoker help lines available to help you quit smoking”. Further, use of a telephone quitline in the past year was reported by 6.9% of current smokers who had tried to quit in the past year and former smokers who had quit in the past 2 years; this was not a significant change from the 2013 estimate of 5.6%.63 Use of a telephone helpline was also asked in some waves of the previous CTUMS survey (see Figure 6.24), although these previous estimates should not be directly compared to CTADS due to changes in question coverage (i.e., recent quitters and smokers who attempted to quit in the last year were asked in CTADS; past 2 years in CTUMS). E-cigarettes have recently gained attention as a potential cessation aid. In 2015, of those current and former smokers who had made a quit attempt in the past year, one-third (33.5%b) reported using an e-cigarette as a cessation aid in the past two years, up from 22.9%c in 2013. 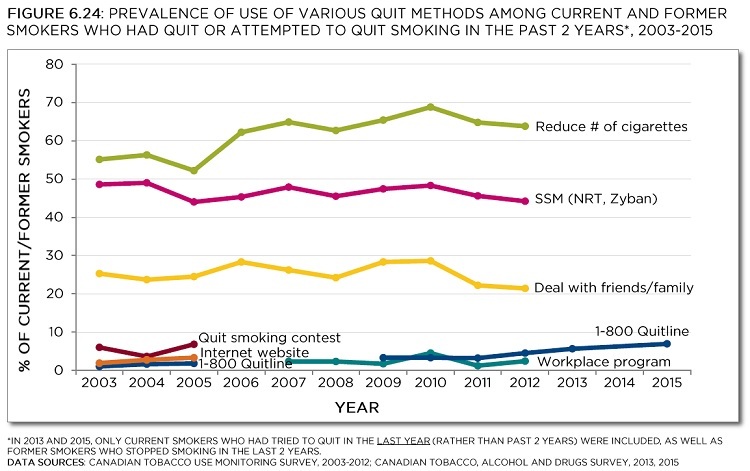 CTUMS asked about a number of cessation methods from 2003 to 2012, which are presented in Figure 6.24 below. In these years, reducing cigarette consumption as a way to quit was popular, followed by stop-smoking medications (SSMs; including nicotine replacement therapy (NRT) and medications like Zyban), and making a deal with friends or family to quit. Other forms of assistance, such as workplace cessation programs, websites, and quit smoking contests, were used by relatively few people in the years with available data. These cessation methods are not assessed on CTADS (2013 onward). *In 2013 and 2015, only current smokers who had tried to quit in the last year (rather than past two years) were included, as well as former smokers who stopped smoking.